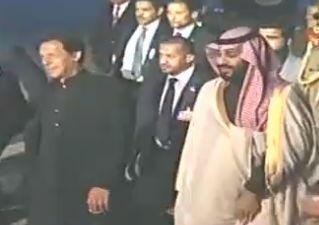 Saudi Crown Prince Muhammad Bin Salman has just arrived in Pakistan on two days official visit. He was received by the Prime Minister of Pakistan Imran Khan and the Pakistan Army Chief General Qamar Javed Bajwa. Earlier upon entering Pakistan air space, the royal aircraft was escorted by Pakistan Air Force JF-17 Thunder and F-16 aircraft, which escorted the royal guest till Islamabad military air base..